This combo is what I came up with to cover up some of the regrowth from my gel nails to my natural nails. 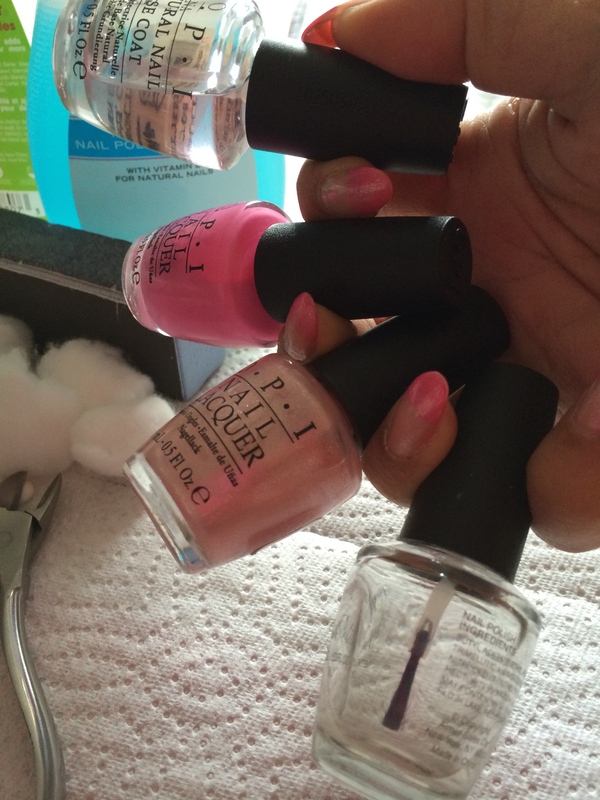 The colours I used are O.P.I.’s “If You Moust You Moust”- from their Minnie Mouse line; and O.P.I.’s – “Princesses Rule!”. I place a couple sheets of paper towel over a hard surface, I normally use a hard covered notebook for painting my nails while watching a movie in bed. 1) Saturate a cotton ball with the regular nail polish remover and hold it on your finger nail for 3-5 seconds while gently rubbing through the U.V. Gel top coat. When you notice that your nail has no more shine, repeat the steps for each other nail. 2) Use the coarse side of your emery board or emery block and start filing down the seam where the U.V. Gel meets your real nail. This won’t be hard to find because there usually is an awkward looking bump. Be patient and file down the nail evenly until it blends into your natural nail. 3) Shape your nail to fit your desired look. Mine were already filed into an almond shape at the salon, so I decided to shape them into a teardrop shape or a “stiletto” shape. The best way to keep things even is alternate shaping each side of your nail with the same pressure. 4) Once you’ve reached your desired shape, buff the entire nail with the finer side of your nail file for a smoother finish. 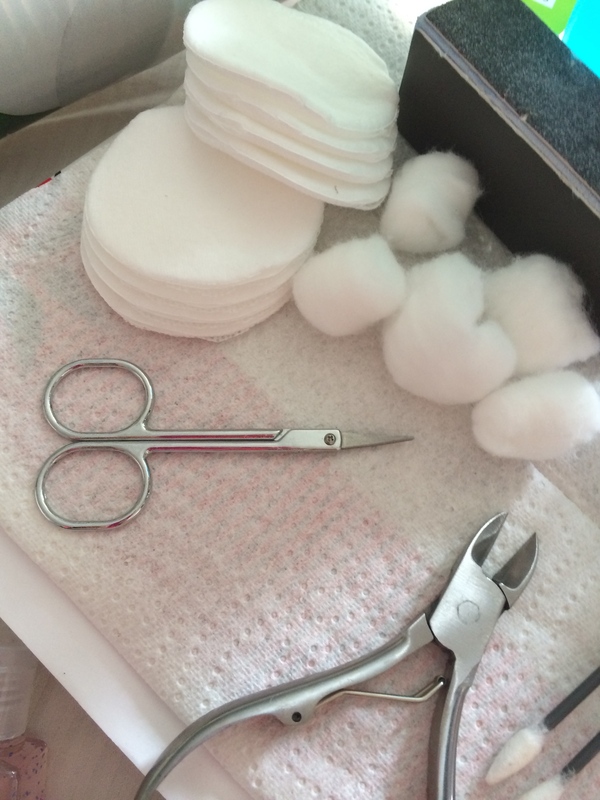 5) Next, using a textured cotton pad, wipe nails with the nail polish remover for natural nails this will help your nails to transition from your U.V. gels to your natural nail while restoring your weakened nails. Most polish remover for natural nails usually contain Vitamin E which will promote healing and strengthening. 6) At this point, I clean up any hangnails or dry skin with the cuticle trimmers and cosmetic scissors where needed. 1) Apply a base coat to each of your nails, most base coats don’t take long to dry so you can immediately start to paint. 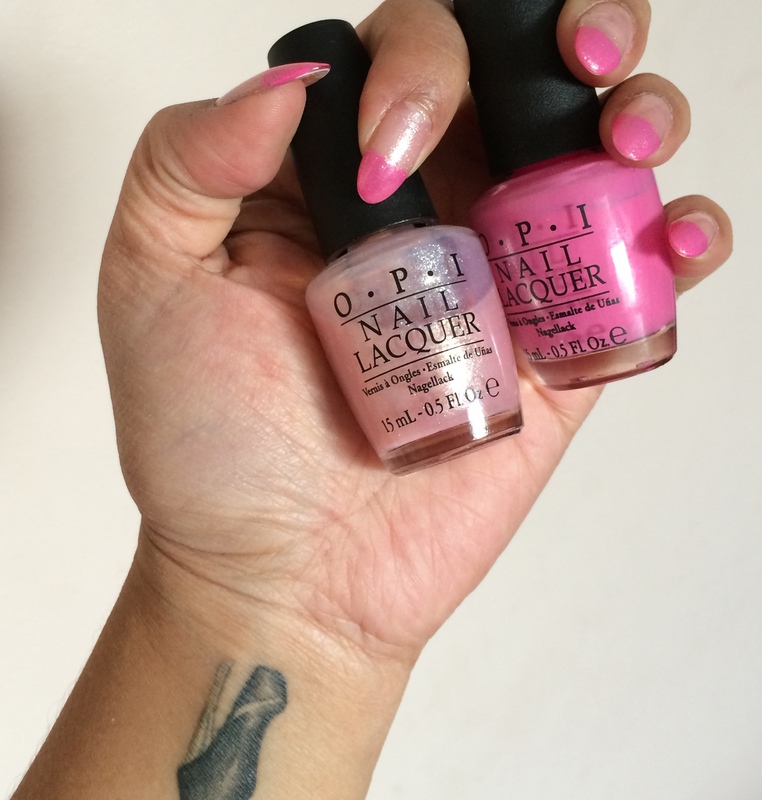 2) Taking the darker of the 2 nail colours, in my case “If You Moust You Moust” by O.P.I. this colour is a solid pink with a slight blue undertone. I applied this colour to just the tips of my nails, it doesn’t have to be perfect as you will be layering the lighter colour over the entire nail which will hide imperfections. Try to get your tips a nice even solid colour. 3) Make sure the lighter colour is translucent. I chose “Princesses Rule!” by O.P.I. for it’s sparkles. 🙂 Apply the polish over the entire nail until you get the look you want. 4) Paint a generous layer of top coat over your nails. If you want to add nail decorations, like gems or polymer clay art, put them on and gently press them into the fresh layer of top coat where you would like your art to be, then add another layer of top coat over the nail and the gem(s) to seal the decorations in. 5) The best part is taking that tumbler, sitting down to relax and watch a movie while waiting until the painted finger tips are fully dry. I hope you enjoyed my quick fix for the times when my schedule can’t allow a salon appointment, it’s important to give yourself the self-pampering session we all need. If you try this out for yourself, please let me know how it went! I’d like to see what you created. You can also tag me in an Instagram pic at stilettosupermom so I can see what you’ve created.